Since it’s the off-season, there isn’t an awful lot happening in the National Lacrosse League these days. Sure, two teams have moved including the team that won the Championship just a couple of months ago. This would be huge in any other sport but in the NLL, that’s just a little unusual. So here’s a lacrosse story, but it’s not exactly a new one. In fact, it’s over 250 years old. The state of Michigan is divided into two pieces: the Lower Peninsula (the “mitten”) and the Upper Peninsula. The two meet at the very top of the mitten at the Straits of Mackinac*, where you’ll find the impressive mile-and-a-half long Mackinac Bridge. At the south end of the bridge is the amusingly-named Village of Mackinaw City (population 806) and within that lies Fort Michilimackinac**. * – Note that whether it’s spelled “Mackinac” (like the straits, the bridge, or the island) or “Mackinaw” (like the city), it’s always pronounced MACK-in-aw. ** – It looks like a mouthful but it’s not that hard to pronounce: MISH-ill-uh-MACK-in-aw. Built by the French in the early 1700’s, the Fort was as much a trading post as a military fort. Fur traders would come from as far away as Montreal, and hundreds of Native Americans lived at or near the Fort as well. The French and Indian War (the North American part of the Seven Years’ War) began in 1754, when the French and Natives combined forces to battle the British and Americans. Most of the fighting occurred much further east in New York and Pennsylvania but once the North American part of the war ended in 1761, the French abandoned Fort Michilimackinac and the British took over. But the British rule didn’t sit well with the local Native population, the Obijwe. Indeed, many Native communities throughout the area were unhappy with the British. (Aside: Even today, they don’t seem to get along, as the British have consistently refused to honour the passports of the Haudenosaunee Nation for lacrosse tournaments in the UK. But that’s another story.) The Natives decided to band together and rise up against their oppressors. This rebellion became known as Pontiac’s War, named after the chief of the Odawa tribe and namesake of both the city of Pontiac, Michigan as well as the GM brand of cars. The way that the Ojibwe chose to rebel was interesting and unique, and here’s where lacrosse enters the picture. This picture of some very old lacrosse equipment (including a horsehide ball stuffed with feathers) was taken by me, though not at Fort Michilimackinac. It was actually taken at Fort William in Thunder Bay, Ontario during the summer of 2012. 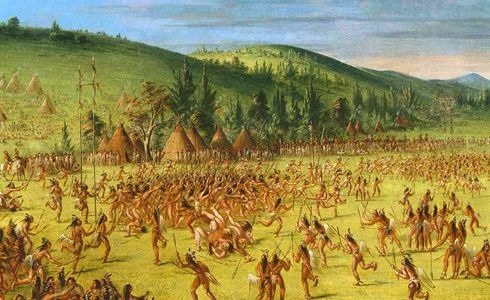 On June 2, 1763, the Ojibwes held a game of baaga’adowe*, a forerunner to modern (field) lacrosse, in front of Fort Michilimackinac. This is something they’d do from time to time, and it always brought out a crowd of spectators from the Fort. As usual, the soldiers left their weapons inside and the gates of the Fort open while watching the game. On this hot June day, none of the British soldiers thought anything was odd about the fact that all of the Native women, who were also watching the game, were sitting near the gate of the Fort wrapped up in thick blankets. * – An Ojibwe word meaning “to hit”. 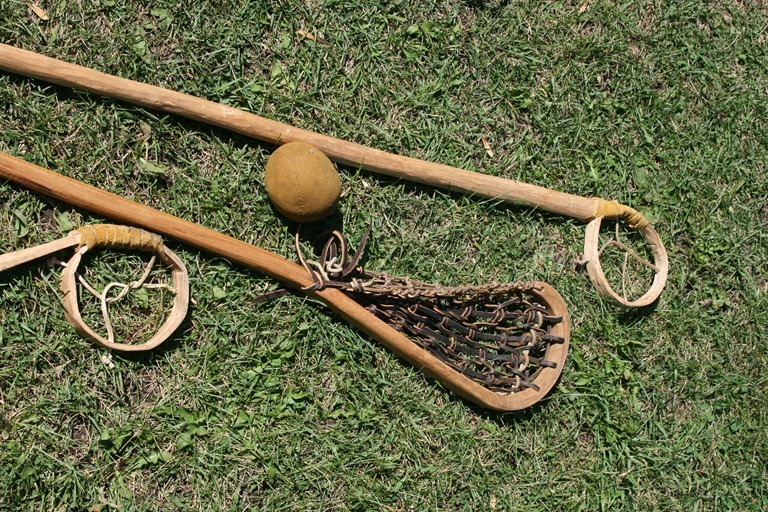 Note that Wikipedia‘s translation of “bump hips” is incorrect – that’s the translation of the Onondaga word for lacrosse. Thanks to Ryan Zunner for helping me get this right! It went on for a while until the ball was thrown through the open gate of the Fort, and at that point the game changed dramatically. As the players ran into the Fort after the ball, the Native women pulled out the guns, knives, and tomahawks they had been hiding under their blankets. The players dropped their sticks and grabbed the weapons. There are lacrosse fights, and then there are lacrosse fights. Geoff Snider and Tim O’Brien had nothing on these guys, and when it was over, most of the British soldiers were dead (though not the French-Canadians who were still there). The Ojibwe took over control of Fort Michilimackinac and held control for a year. The Ojibwe really had no interest in the Fort itself, they just wanted the British out and they staged the deadliest game of lacrosse ever played to do it. A year later the British reclaimed the Fort with no bloodshed, promising more gifts to the Ojibwe in exchange. They would later combine forces against their common enemy, the brand new United States of America.